Up to He said the estates of people who have died would also be eligible to claim.The scheme aims to help thousands of people wrongly targeted by the Home Office's "hostile environment" strategy for illegal immigration.The Windrush scandal takes its name from the Windrush generation - the estimated 500,000 people from Caribbean countries who arrived in the UK between 1948 and 1971 - and who were the majority of those affected by the hostile environment strategy. But Mr Javid said people from other Commonwealth and non-Commonwealth countries who arrived in the UK before 1988 were affected and are eligible to apply for compensation.They had been granted indefinite leave to remain in the UK, but changes to immigration law in 2012 meant many who arrived as children, without their own documents, found themselves unable to prove their status.Some were subsequently held in detention or removed, despite having lived in the UK for decades.Mr Javid said the scandal was of "profound regret" and he hopes the scheme goes "some way" to helping those affected by the "unacceptable treatment". The home secretary said there was no cap for the amount of compensation that could be paid out per claim but the total "baseline estimate" was ?200m.One of those affected by the scandal, Glenda Caesar, lost her job as a NHS nurse at a doctors surgery as a result of the scandal, as she no longer owned a British passport. She told the BBC's Victoria Derbyshire programme she "couldn't work or receive benefits" and describes getting to a stage where "I just wanted to take some tablets and sleep". Asked what she hopes to get from the Home Office scheme, she said: "Validate my loss of earnings, validate the emotional distress I've had to go through. I'm asking for not millions... but look at what I was earning, my pension - 10 years of my pension I lost as well - validate that." Willow Sims, another person affected, says she is torn, as she "doesn't care about the money" and wants to "not feel like a criminal" so she can move on. But she says she sees her children struggling, can't pay the rent, and is having to borrow money from friends and family. "I need to at least recoup what I have lost", she says. 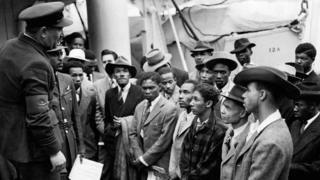 Meanwhile, victims of the Windrush scandal claim they have been snubbed from an official reception to launch the compensation scheme.Immigration lawyer Jacqueline McKenzie says she was asked to invite a handful of her clients to a "Windrush engagement" event, but only two of the six clients she represented were sent invitations. She says it proves "nothing has been learned" by the Home Office and that "this group continues to be treated with contempt". She said: "There will be drinks and canapes, and you know the black bourgeoisie, as I call them, the glitterati - they'll all be there. "But Ms McKenzie says the event should have been about "discussing this seriously with the people who work with Windrush [victims] and people who are affected by the scandal. "She also criticised the government for failures in setting up a hardship fund after the scandal came to light, saying "hardly anyone" been granted emergency support by the Home Office to date.